Earlier this week, the MacArthur Foundation released the results of its third annual How Housing Matters survey. Conducted by Hart Research, the survey of 1401 adults identifies a strong belief in the importance of stable, affordable housing to achieving a middle class lifestyle. But affordability challenges that respondents have experienced in their own lives, and see in their communities, contribute to a sense of pessimism about Americans’ chances of social mobility, and a majority still feels that the country is in the midst of the housing crisis that began 8 years ago. Several findings resonate with our recent work at the Joint Center. As our forthcoming State of the Nation’s Housing report will show, the persistent problem of housing affordability continues to cause households to make difficult trade-offs. Over half of survey respondents reported making sacrifices in the past three years in order to pay for housing. The most common was to take on a second job or work more hours. Worryingly, a number of other trade-offs bode ill for peoples’ futures: many respondents reported that they have stopped saving for retirement, are accumulating consumer debt, and are cutting back on food and healthcare in order to meet housing costs. These stop-gap measures, necessary to ensure the rent or mortgage is paid, may add to financial and health strains later on. Renters, cost-burdened/distressed owners, younger adults, minorities, lower-income respondents, and city-dwellers are most likely to have made at least one trade-off in the past three years. 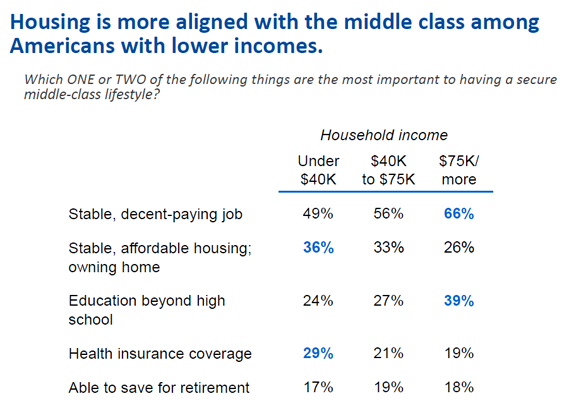 The survey also explored beliefs about upward mobility and found that, particularly for those with lower incomes, stable, affordable housing or owning a home is seen as one of the most important factors in achieving a middle class lifestyle (Figure 1). 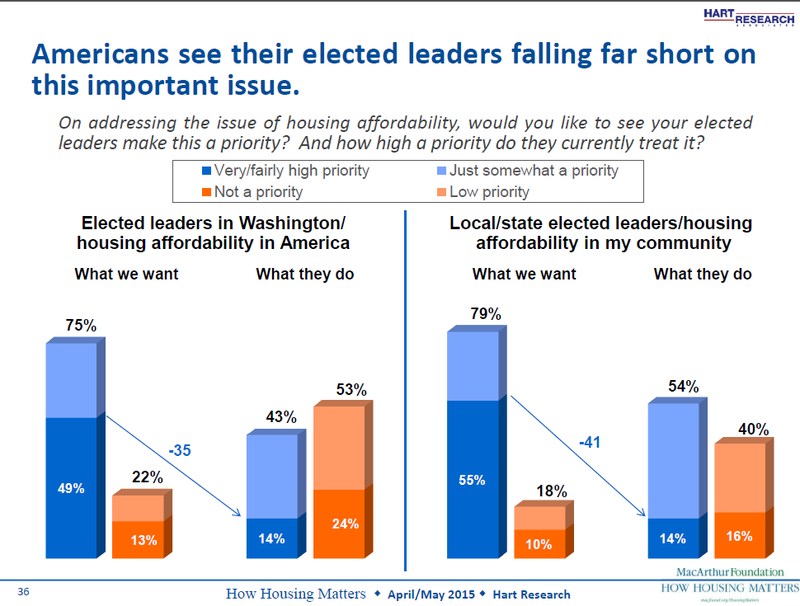 But a majority think that finding quality, affordable housing in their own community to rent or buy is challenging. 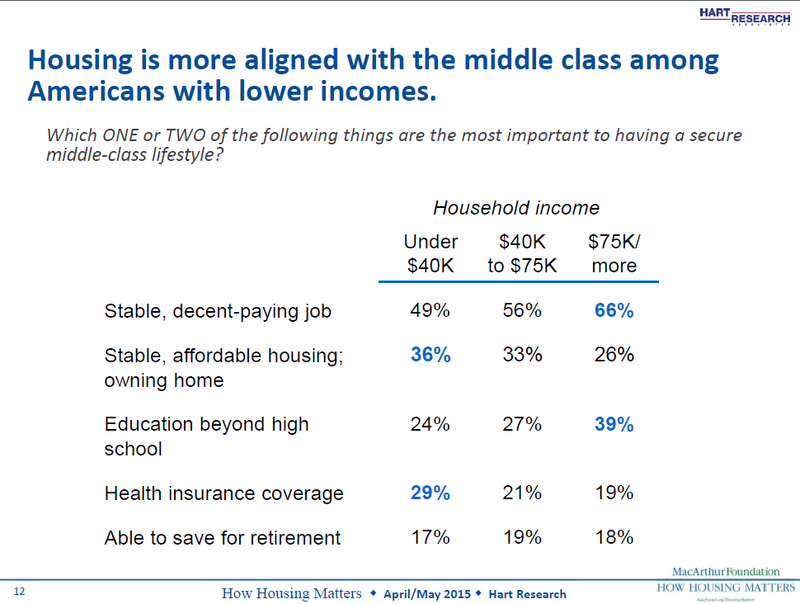 And across age, race, and income levels, respondents expressed significant pessimism about the chances of rising from a lower economic class to the middle class, and believe it is harder for younger people today to save for retirement, own a home, find stable, decent-paying employment, and have a stable, affordable housing situation. Fully 79 percent think that middle class people fall into a lower economic class more frequently than the other way around. One of the least optimistic groups of respondents were those aged 54-64, 85 percent of whom thought that downward economic mobility is more likely in today’s world than upward mobility. This group was the most likely age cohort to see housing affordability as a serious problem in the nation. As our own research points out, those aged 50-64 were hit particularly hard in the housing crisis; as a whole, the age cohort’s homeownership rate declined by 5 percentage points from its 2005 peak, many saw a loss of wealth and have been living with stagnating wages, and the group has higher levels of housing and consumer debt than in the past. Member of this group who are housing cost burdened (paying more than 30 percent of their income on housing) make difficult trade-offs including forgoing retirement savings – again setting up the potential for greater difficulties in the future. Though the 50-64 year olds are most likely to view housing affordability as a serious problem, their worries are shared with the other age cohorts surveyed in How Housing Matters. Sixty percent of all respondents think that affordable housing is a serious problem in the nation today, and 61 percent believe we are still in the midst of a housing crisis – with one in five thinking the worst is still to come. As we head into a presidential election season, skepticism about the ability of Washington to intervene effectively, as well as ideological beliefs about the government’s role in solving this problem, present some clear hurdles to making affordable housing part of the national discussion. Over half of respondents (53 percent) believe that housing affordability is not the responsibility of the federal government. Follow-up interviews revealed that many in this group who see housing affordability as a serious problem are unclear about what government can do. They also lack confidence that federal intervention would be effective, or have ideological concerns about federal involvement. Yet the survey also identifies some opportunities. 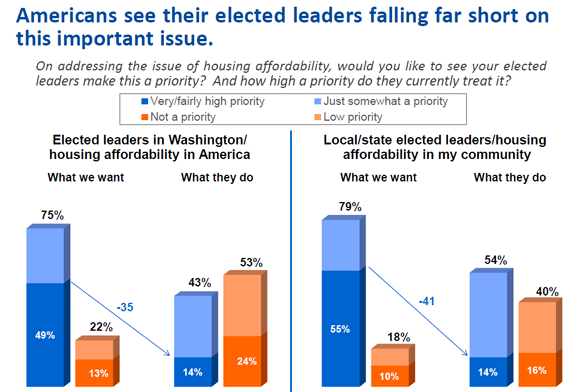 Though just over half stated that housing affordability is not a federal responsibility, 49 percent of respondents feel that housing affordability should be a very or fairly high priority in Washington and slightly more believe it should be a very/fairly high priority at the state and local levels – yet only 14 percent believe it already is (Figure 2). Among the reasons for ensuring that housing is a higher priority on the policy agenda, respondents found that the relationship between housing and children’s health and well-being among the most compelling: the belief that living in safe neighborhoods in quality, stable housing helps children’s mental, social, and academic development and allows families to spend more on their education and enrichment. Linking housing affordability to children’s well-being – as well as highlighting the sacrifices made by millions of cost-burdened elderly and low-income households – may help make the case that housing does indeed matter.